Probiotics are a tricky topic in SIBO patients. There are some doctors who don’t recommend probiotics in SIBO patients and others who believe they are a necessary part of treatment. The only way to find out if they can help you is to test a few well-researched strains in small amounts and see how your body reacts. The most important thing to remember is that everyone has a unique microbiome and genetics so it really comes down to choosing the correct strain which delivers the necessary therapeutic action. When choosing the best probiotic for SIBO it’s important that you test a strain that has been researched well, is made from a reputable company that guarantees the amount until expiration, and has the necessary therapeutic action you need based on symptoms. In this review, we will outline the best probiotics for SIBO based on the scientific evidence so that you can find a probiotic strain that actually has positive therapeutic effects. 12 What Exactly Are Probiotics? 13 What Are Probiotics Used For? 14 How Do Probiotics Work? All of the probiotics listed in the chart above have been proven in scientific studies to help with certain conditions like IBS and SIBO. Let’s dive a little bit more into these specific probiotic strains and highlight the studies and details of each one. Evidence: In this study, ScB was used in the treatment of SIBO in pediatric patients with short bowel syndrome. The treatment was used for one month and patients showed decreased levels in hydrogen gas as well as significantly decreased digestive symptoms. Who may benefit: This beneficial yeast is ideal for people with SIBO, IBS, immune deficiency, travelers diarrhea, and more. It is an all-around good strain. Evidence: In this study, a 4-week treatment with L. plantarum 299v provided effective symptom relief, particularly of abdominal pain and bloating, in IBS patients fulfilling the Rome III criteria. Who may benefit: This probiotic strain is ideal for people with IBS, abdominal pain and bloating. Evidence: In this study, after week 4 of probiotic therapy, six patients showed symptom improvement on global symptom assessment compared with baseline. VSL #3 has also shown to reduce IBS symptoms in numerous other studies. Who may benefit: This probiotic strain is ideal for people with IBS symptoms, IBD, and other more severe intestinal dysbiosis. VSL #3 has to be refrigerated. Evidence: In this study, 100 people with functional gastrointestinal symptoms who tended towards constipation were given a high dose (17.2 billion cfu) of B lactis HN019, low dose (1.8 billion cfu), or placebo for 14 days. The result concluded that whole gut transit time decrease was statistically significant in both the high dose and the low dose groups. The strain also reduced other functional GI symptoms. 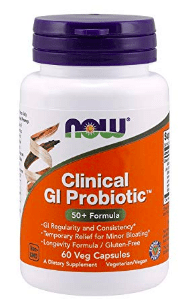 Who may benefit: This probiotic strain is ideal for people with functional GI symptoms who tend towards constipation and have slow intestinal transit. Evidence: In this study, which is the same as the study cited above, B lactis HN019 decreased intestinal transit time by 57%. Both Now Foods Clinical GI and Metagenics Ultra Flora Acute Care contain this strain of B lactis. Evidence: In this study, it showed the B animalis lactis DN-173 010 decreased colonic transit time in women. There are also numerous other studies with this strain showing its effects in constipation and IBS-C.
Who may benefit: Patients with constipation, slow colonic transit, and IBS-C. Evidence: In this study, B infantis 35624 was trialed in women with IBS at different doses. The results after 4 weeks in a large study of 362 IBS patients showed that the dosage of 108 CFU was superior to all the other doses and showed significant improvement in abdominal pain, bloating, bowel dysfunction, incomplete evacuation, straining, and gas. This is just one of many studies that show significant benefits in IBS patients. Evidence: In this study, L reuteri DSM 17938 was shown to decrease methane gas in constipation patients determined by the lactulose breath test. Evidence: In this study, Lactobacillus rhamnosus GG was shown to reduce frequency and severity of abdominal pain compared to placebo in children with IBS. In order to select a quality probiotic that can help improve your health, it is important that you understand the basics of probiotics and what to look for in a “good” supplement. There is a lot of marketing hype and many ineffective strains on the market currently, but if you understand the basics you can select a quality product for your specific need. I learned a lot of my probiotic knowledge from Dr. Jason Hawrelak’s Probiotic Course. If you want to really understand probiotics I recommend taking his course by clicking on the image below. What Are Probiotics Used For? This is something that a lot of people don’t understand. The probiotic product must be strain specific. Bacteria are named with 3 different naming classes: genus, species, and strain. For example, Lactobacillus would be the genus, plantarum would be the species, and 299v would be the strain. Put together, this bacteria would be called Lactobacillus plantarum 299v. The most important thing to remember is that the actions of the probiotic differ based on the specific strain. It is not enough just to know the genus and species of bacteria. The product must be a well-researched strain specific bacteria. Using probiotics in patients with SIBO can be a bit trickier than the person with the average digestive complaint. For some SIBO patients probiotics can make their symptoms worse. This may be because they have slow gut motility in the small intestine and already too much bacteria present which they can’t clear out effectively. In these types of people, it’s best to try the strains that have been shown to improve intestinal transit time. Patients with SIBO and IBS may need to start small and slow to monitor the changes in their body. When in a severe disease state the gut and nervous system can be much more reactive. Test a specific strain with the necessary therapeutic action without combining numerous different products to conduct an accurate test. In summary, if you have SIBO or IBS finding the correct probiotic may be a bit trickier. The chart below will help you find the best products to try based on strain-specific research done in IBS and SIBO. Decide what therapeutic action you need help with (constipation, diarrhea, slow transit, etc) and pick one of the quality products below to test slowly. If you want to see an overview of the different treatment strategies used for SIBO and how probiotics fit in see the guide here.